You're engaged! Huzzah! You get to plan an awesome party, but that's not all! You also get to pick out exact presents that people might actually buy you! Eat that, entirely unfulfilled Christmas wish for a pony! Now, you are digging through the giant pile of stuff you are "supposed" to get and figuring out what you want. That's awesome, and it sure is a lot to process, but I am going to ask you to consider one other thing. Rather than just picking things for your wedding registry based on what you want (or feel like you are supposed to have), focus on registering in a way that is good for the Earth around you. You have a long and wonderful future ahead of you, what better foot to start on then to gift yourself clean air, drinkable water, and a healthy Earth for your life? The best toaster in the world can't compare to water you can drink, so it's worth it to rethink your registry. If you have the choice between two sets of plates- they are the same color, both match your style, and cost comparable amounts, but one traveled a much shorter distance (saving fuel and keeping greenhouse gases out of the air! ), was made in a factory with higher standards, and helped Americans have jobs, wouldn't you rather have the plates that did some good? All you have to do is poke around, and you can see there is a big difference in buying Oneida plates (boo!) versus Fiesta ones (woot woot!). Doing this for every object on your registry sounds tough, time-consuming, and possibly fruitless, especially because we can feel like there are never any good choices available. We've all heard "Everything is Made in China." It's not true! Yeah, tracking down good options is a huge chore, but I have already done that for you. For almost everything on your registry, better options abound! I am going to make it easy by giving you all the information I can find. 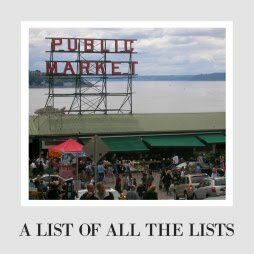 Click through my lists and follow the links, and you can have a totally ethical registry in no time. 1. Take Stock of What You Already Have- Your two lives are officially binding together, and so is all your stuff! Do you and your partner actually already have plenty of silverware that looks pretty good together? Cross those off the list. Do you already have a bar set? Off the list! The most eco-friendly thing any of us can do is use what we have instead of just buying more because we can. If it still works, use it! Having fewer things on your registry is not a crime, so the first step is to shrink your list! 2. 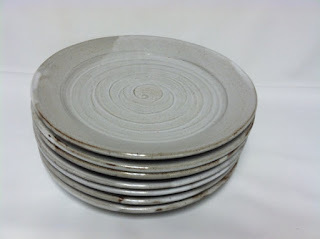 Buy Used- So many of the things for the dining room- Plates! Silverware! Hot Pads!- can be found in every antique store ever. If you are bohemian enough, you could do a cool mix. 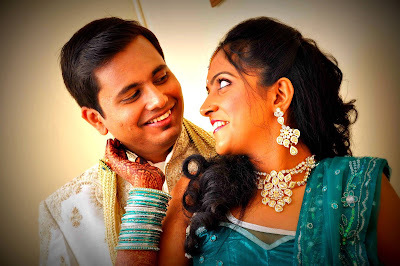 If you are marrying an engineer, maybe not. Still, keep an eye out for cool servers or plates, because you may be able to cross more things off your list and minimize your impact this way. 3. 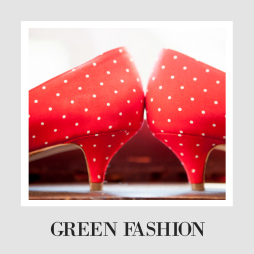 Buy American and Recycled- More specifically, buy as local to you as possible. The shorter your stuff has to travel, the better it is for the environment and for the immediate world you live in. The more of your money goes to United States manufacturing, the more you can feel safe they had to follow environmental and labor standards, not to mention give other Americans jobs! Your stuff shouldn't travel way farther than you do! Is making a registry often painful? Yep. But if you at least come at it from this angle you can get things that are really useful to you AND do a little good! Let's do this! 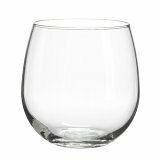 Our Pick- We have one 12 set of stemless wine glasses (specifically, these ones from Libbey), and that has served us perfectly well for all alcohol-related endeavors. 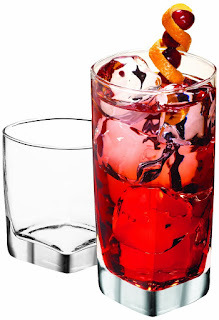 If you are fancier than us, I trust you to know what glasses you need to buy (I found a list that suggested Red glasses, White Glasses, Champagne flutes, Margarita Glasses, Martini Glasses, Higball Glasses, Beer Mugs, and Brandy Snifters- wow, that seems like a lot- how often do you need to snift some brandy?). Buy the cups for the booze you want to drink. - Libbey has just about all of these glasses, all American, so they are my pick. - Anchor Hocking also sells most of these glasses, all Made in the USA. - Crate and Barrel has a line of made in America bar glasses as well, from Champagne flutes to Pub Glasses to Hurricane Glasses. - Taylor'd Milestones sells whiskey glasses and other barware too. Williams Sonoma sells monogrammed and made in America options, but no one wants to drink out of a cup with your initials on it (even you five years from now)- monogramming is almost always creepy and pointless, in my opinion. If you want plastic because you host large or rowdy parties, check out Govino. You can reuse these plastic glasses indefinitely, and then they are recyclable. I have actually seen these at work at parties, and people were impressed. If you want something fun, check Etsy. They have every kind of drinking glass from beer bottle shot glasses to wine glasses with brains etched into them. 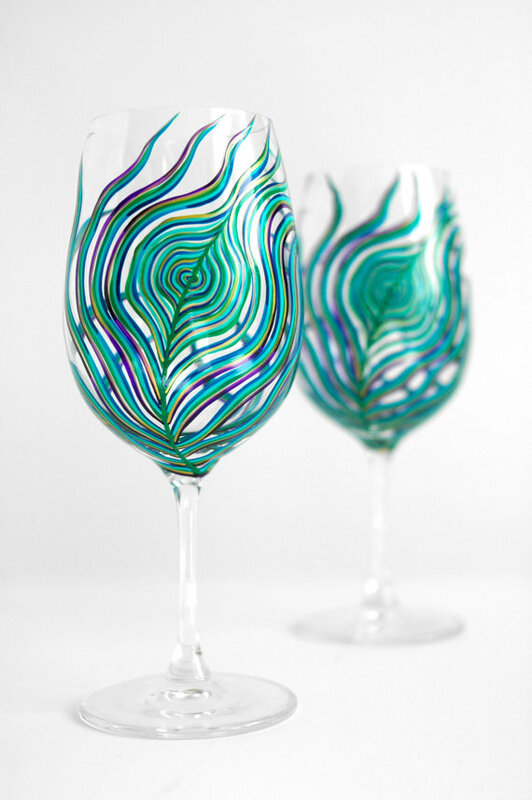 - Mary Elizabeth Arts makes really special hand-painted wine glasses that you could treasure forever, though they do lean a little feminine. - Yevgenia (one of my longtime favorite Etsy stores) also sells handpainted wine and water glasses. I have trouble believing anyone needs a full set of margarita glasses, a set of champagne flutes, or shot glasses (if you don't have them by now...). If you aren't sure what to get, make like us and just do stemless wine (you could even get a cute set like this or this for special occasions). Need something really adulthood-defying to gift? They even have a miniature beer pong kit and cocktail mixers. Bonus- Want some swizzle sticks? Royer Corporation sells glass swizzle sticks, made in America, that you can use for as long as people like to drink. Our Pick- I love everything from Juxtaposition SC. Most of you have one of these by now. If not, probably should register for one, because even if you don't drink, someone will bring beer or cider or something to your house, and it's the worst if you can't open it. 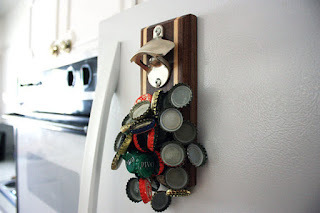 - Luckily, Etsy has plenty of bottle openers for relatively cheap. You can get something simple from Teals Prarie, a wall mount one from Nevermore Gifts or Robs Rustics, a Railroad Tie from Northern Crescent Iron or a pretty magnetic wood one from Laughing Tree Woodshop. Bottle Ops sells a magnetic bottle opener on Amazon. I also love the Pocket Monkey from Zutility, which includes a bottle opener and looks pretty useful generally. If you want a corkscrew, I did find a BOJ one Made in Spain, but nothing domestic, so you might try to find it used? Our Pick- If you are going to do glass, the best Made in America option might already be on your registry: Anchor Hocking. We bought a box of 24 16 oz glasses (I think a commercial set), and they have held up for years. They are about a dollar a glass, so cheaper than all the lower quality glasses. - Anchor Hocking's products are made in the US and are pretty widely available. They have wav, squared off, classic, grid , and these pretty curved sets. - Novica sells sets of recycled blue glasses from Mexico, which look amazing and are fair trade. 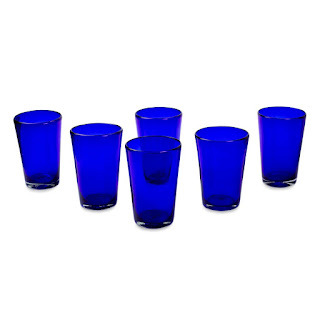 If you are doing blue in your kitchen, these would be great. They also have one set in a teal color. - You can also get recycled bottle glasses on Uncommon Goods and find glass sets made out of old wine bottles. 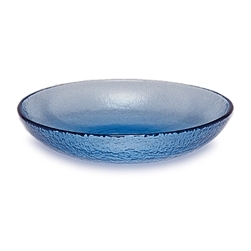 - If you are in the area, Mosser Glass in Ohio sells glasses on their website but are low tech enough that you can't buy them online (you can find their cake stands and bowls more easily). - Fiesta also makes a set of striped everyday glasses here, and they look like a fun addition if you are going the colorful route. First and foremost, you can start married life with one set of plates. You don't need formal China unless the Dowager Countess is coming over, and sadly for most of us, she's not. I will list some things that are china, but I really want to empower you not to get suckered into fancy plates you won't use. Pick something you can love for casual nights just the two of you as well as for company. 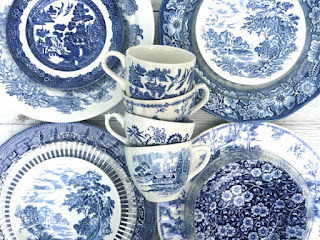 A wedding registry can be a good opportunity to upgrade from the janky plates you have been lugging around since college, so I get the desire to get something nice, but I think multi-purpose would work in most of our lives (especially since heirloom china is coming to lots of us). Another piece of advice? When in doubt, pick white or neutral. I am a color girl, I love color, but you don't know how your taste will change over time, and you want these to last you as many years as possible. Alright, back to plates. In all honesty, I think we have 16, because we bought two sets of eight, but unless you plan on hosting pretty large parties, that many might be overkill (for the sake of honesty, I actually broke one of those plates whilst working on this blog, so now we have 15). I am just going to go through the many, many options for sets in alphabetical order, and all of us who already have our plate set can get really jealous. They come at different price points too, so if one is out of your range, try the next one! If you can, register for the pieces individually, because it is so much easier on your guests! 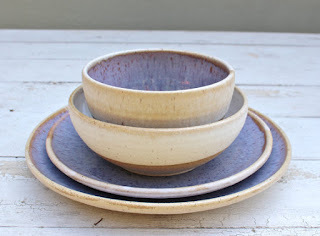 Altheas Pottery on Etsy sells rustic handmade plates that might look amazing in a more country kitchen. I think they would look good on a long wood feasting table. 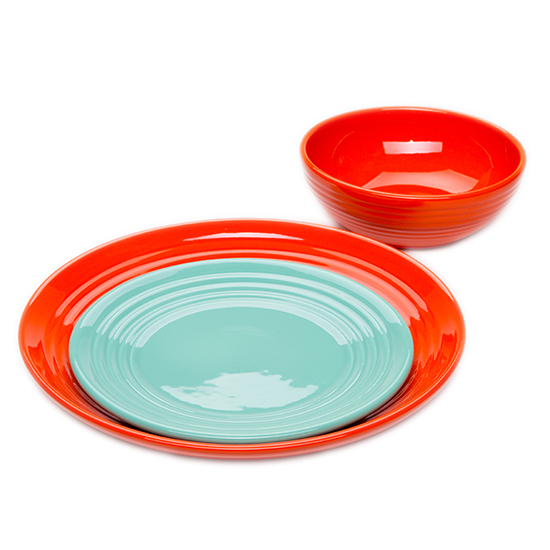 Bauer Pottery sells two different types of plates out of their California factory- the Bauer line is bright and colorful, while having a slightly mid-60's retro feel But it would depend on which colors you choose. They have every accessory and serving implement under the sun to match, so you could really commit. 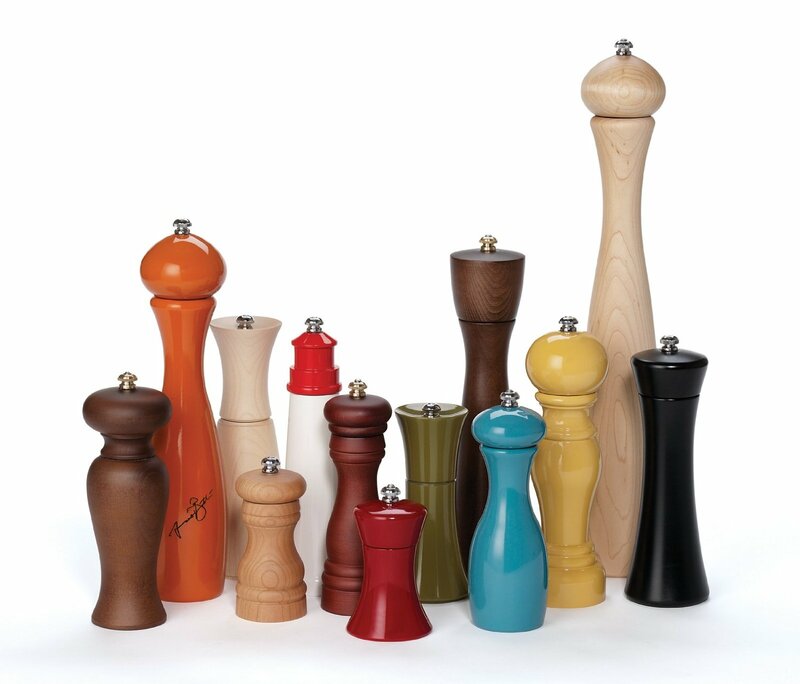 They also have the Russel Wright collection which is more smooth line modern and limited in its selection. Be sure to check both to see if one is your style. 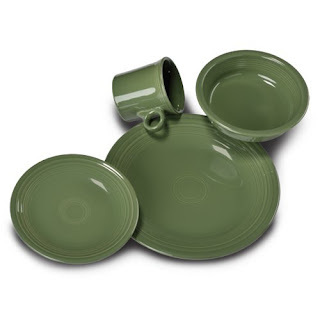 Bennington Potters from Vermont makes two lines of dishes (also mugs, serving platters, you get the deal), but I think the best option for browsing is to shop by glaze (I do like the Emerald line myself). The Classic Line has been their bread and butter for 60 years and the New Line is, as you might guess newer (it also comes in fewer colors, though I personally like the subtlety of the newer line better). 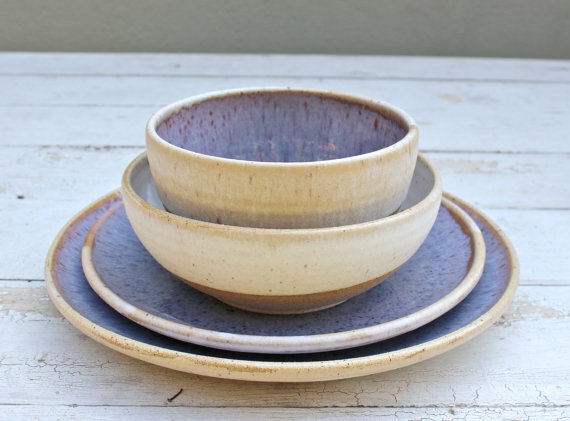 Both sets come in beautiful glazes and look like the kind of plates you would use forever. Corelle is now part of World Kitchen, which also manufactures products in Asia, but at least for now Corelle is still made in New York. Still, maybe not the best choice anymore.They sell all sorts of casual dining sets, and they last forever (we used my grandparents' set until we got plates of our own for our wedding, so at least 40 solid years of use). You can also find lots of vintage Corelle sets on Etsy (seriously, these plates last forever). This Woodland Set from the 70's is my favorite. I am currently obsessed with the Emerson Creek Pottery Go Green line of ceramics, which stays away from toxic chemicals and mass production. 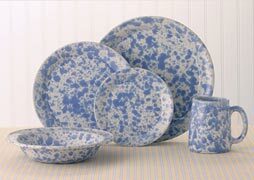 It's a little expensive, but really not more than some name brand plates, and I think this would be a beautiful set for anyone with a bit more of a rustic style. I really like the color. Fiestaware makes all of their plates in the US in tons of gorgeous, vivid colors. You could register for all one color or mix it up (my friend did this and it looks GORGEOUS) and get a couple of colors to mix and match. My mother-in-law wanted these from us, so I did some research on them, and they really are awesome. She got an off-brand China-made set first, and they turned out to be junk, so she is buying Fiesta stuff now. Fiesta sells literally every table piece you could possibly think of. Fire and Light doesn't sell sets, but if you loved the look of their translucent glass plates, you could register for the piece separately. It would be a very pretty regular set, and it has a good combination of rough and smooth elements to make it work with a lot of other pieces. Heath Ceramics even has their own registry (though I recommend getting one that can link to multiple websites). They are based out of Northern California and sell their tableware to fancypants restaurants in the area. Their plates look clean, modern, and really chic. When you go to someone else's house and notice they are way cooler than you, they have these plates. You could be that person (and buy American!). HF Coors makes all of their ceramic plates from scratch in Arizona. They mostly come in really bright vibrant designs, but I personally like the Frank Lloyd Wright Whirling Arrow Design. J Clay Pottery makes beautiful ceramic plate sets with a modern, minimal, yet somewhat rustic feel. A big feasting table in a clean, white-walled room. A big bonus of the store being on Etsy is that they say in the description to contact them, and they will help you come up with the perfect set. J Clay Pottery is also very concerned with the environment, so their packaging is all biodegradable. 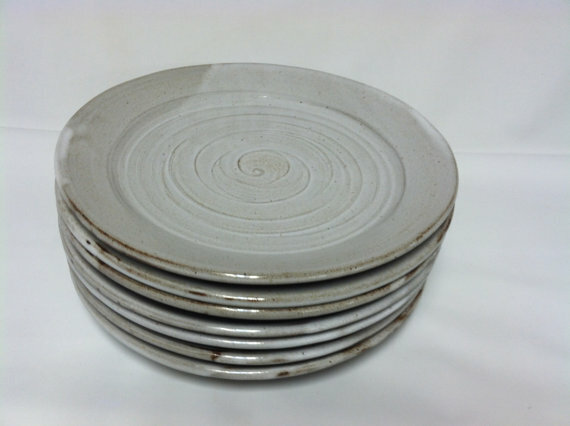 Peter Sheldon Ceramics out of Los Angeles sells their white stoneware plates on Etsy. They look like the gallery space of plates, so if you make gorgeous food, I've found you a canvas! Uncommon Goods also has a few beautiful and very unique plate sets that are made in America. I love this wood print one. This set is inspired by birch trees. This one has a honeycomb pattern. 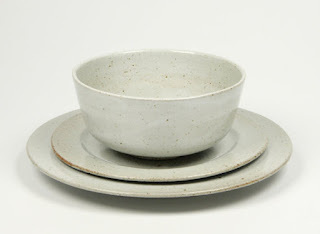 Alex Marshall makes pretty stoneware collections also on sale at Uncommon Goods. I also addressed these in the Kitchen Tools Part of the Registry, so here is the short version. Get them, they will save tons of plastic, because you can buy salt and pepper in bulk instead of those little plastic grinders. 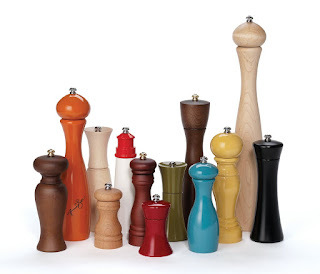 If you want shakers, you can find TONS of cool ones antiquing or in consignment. - We use Fletchers' Mill grinders, which come in lots of designs and materials, and are made right here in the US. We have had ours for a year or so, and we love them. - William Bounds sells pretty ones with the crank, which look super cool. - Chef Specialties sells an affordable set that comes in a smaller size in case you don't eat at home much (might be a nice middle ground if you think a big old grinder looks fussy). Do not register for too many of these! Like so many things, people will have a wonderful idea of what to get you instead, and you will end up with a bunch of serving plates you didn't ask for on top of what you did. So don't over-register for this. If you pick one of the companies above for your plates (and really, why wouldn't you? ), my first suggestion is to poke around and see what their line offers in terms of serving plates and bowls (Corelle, Fiesta in multiple sizes). You can probably find exactly what works for you there. 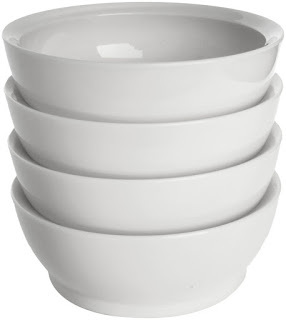 And this is one where you can always get more if you have a big event looming and a need for more big bowls. But you don't have to go crazy now. Our Pick- Every kid who grew up in Western Pennsylvania has a collection of Wendall August Forge stuff- bookmarks with praying hands, collectible plates with wagons on them- it's just part of life. 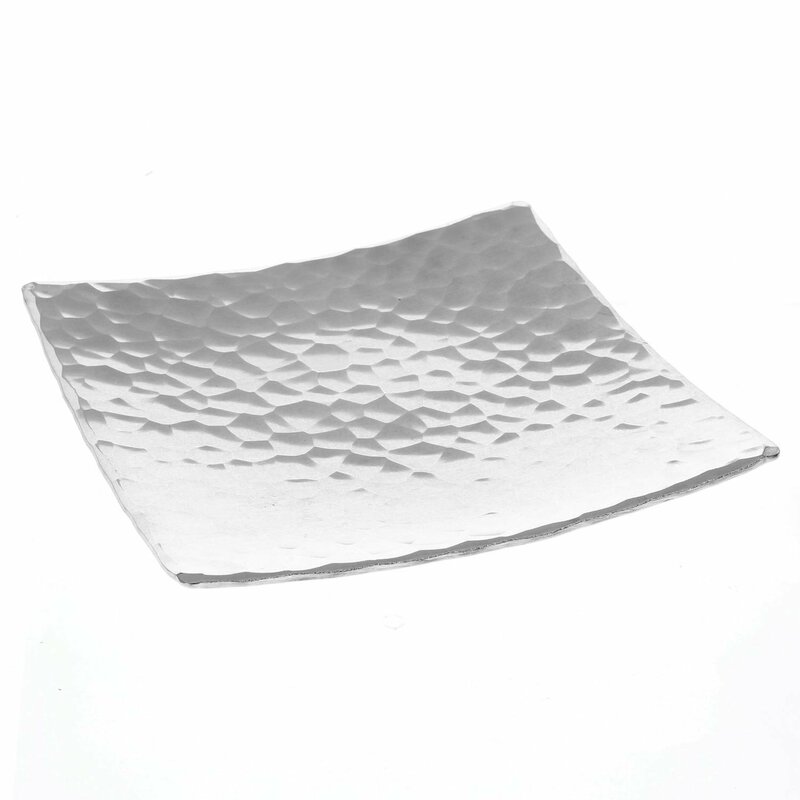 Beyond that kind of thing, this great company also makes more subtle serving plates with simple, sometimes modern patterns. I currently want one to go with our collection of small town scene ones. 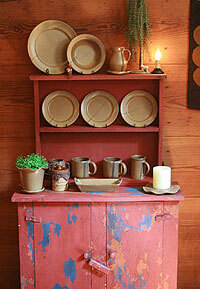 - Emerson Creek Pottery's Go Green line has tray and bowls, both in the beautiful natural tan color. I think the warmness would make your food look great as well. - Bauer Pottery sells serving platters and bowls as part of their line of dinnerware (not to mention cookie jars, salt and pepper shakers, etc). I also really love the syrup pitcher. - Fire and Light makes truly ridiculously pretty glass serving plates and bowls from recycled glass out of Arcata, California. Even if most of your stuff is a different look, I think these would complement a lot of styles while being a unique addition. - HF Coors sells serving platters to match, though I personally really like the chili pepper ones. 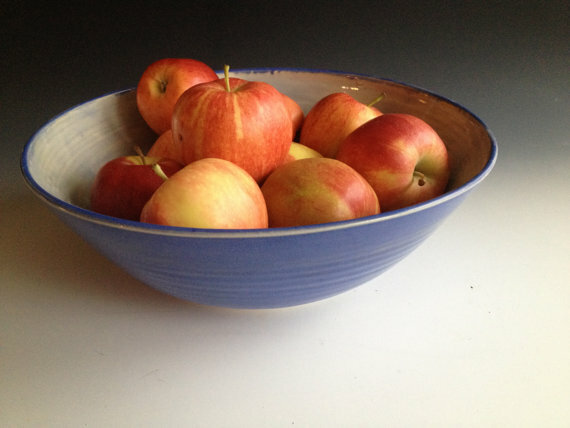 Leslie Freeman Designs sells plate sets, but I like their large serving bowls the best. This would look pretty with so many different place settings. You can also get cool vintage serving plates on Etsy or at antique stores! 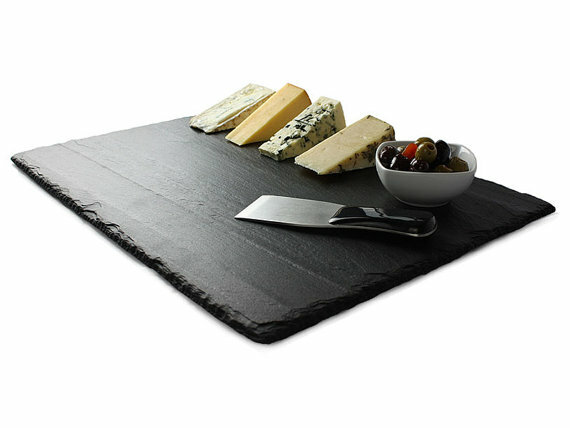 Lots of the wooden cutting boards could also be used as serving boards, especially for cheese. Epicurean sells boards especially for this purpose, and they even have ducks on them! Extra fancy! Uncommon Goods also sells a pretty stoneware serving plate. This one goes straight from the oven to the table, so it could be great if you want to keep something hot. If you want to serve pizza, this would work, especially if you enjoy things on the nose (get the calzone plate separately). I feel like this is another one of those things that can get out of hand on a registry, convinced you need way more than you do. You definitely need some big spoons, though I don't know how much you need that can't also be used as a kitchen tool. - One set of pretty wood spoons, like these made in Pennsylvania, is most likely plenty. 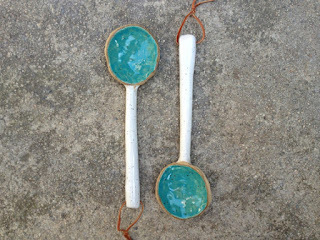 - Architec sells these serving spoons made out of recycled material which that make in a zero waste facility! That's awesome (and you can get a matching bowl and spoons in other colors). - Rada Cutlery also sells metal servers that would be good for lasagnas, cakes, etc. - J Clay Pottery also sells pretty ceramic spoons that might be a perfect addition to a serving set, especially with clean, neutral plates. Every antique store in the world has a collection of silverware, so if you are determined or bohemian enough, you could proobably make yourself a pretty interesting (and cheap) set. That being said, if I suggested an eclectic mix of silverware to The Boy, his head might explode, so I understand if this lands in the "new' pile. 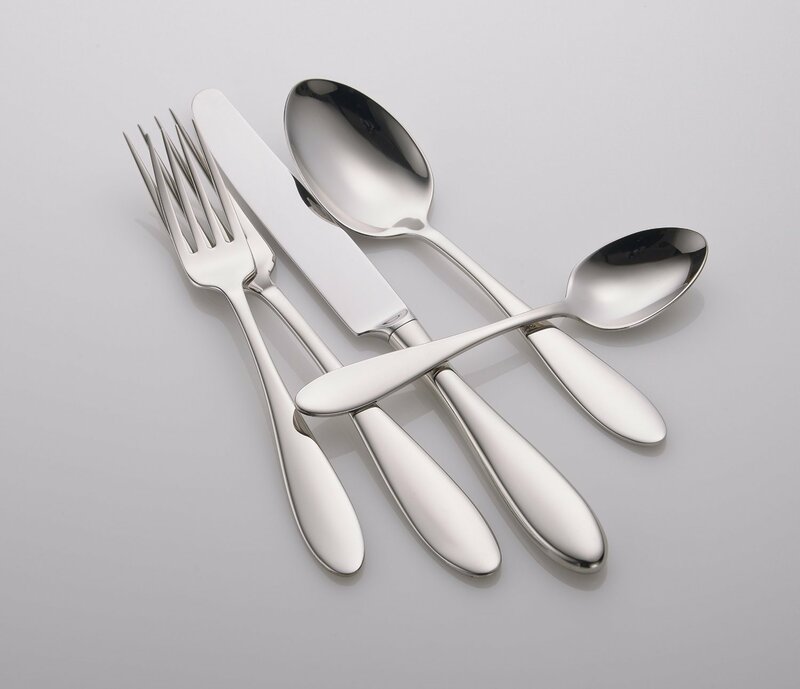 Our Pick- If you want to get made in America silverware (and really, why wouldn't you? ), I think the best option is Liberty Tabletop. Liberty Tabletop bought the factory Oneida gave up when they moved all of their manufacturing overseas, and they really have a great reputation (better than those former commune sell-outs at Oneida).You can find many sets on Amazon, but check out their website if you are looking for something specific. Seriously, register for this silverware! It's a no-brainer! Their silverware is beautiful, made here, and come in plenty of styles so you can find something that matches your aesthetic. They are still in the same range as most silverware as well. Annapolis is clean with a simple curve. My favorite is Betsy Ross. Lexington is a little more square and traditional. Pearl is a little more curvy, almost teardrop-shaped. - Heath Ceramics also has a line of silverware that would look freaking amazing if you are going for a clean modern minimalist table. This isn't generally my style, but I have to admit, these are really sharp (and still made by Liberty Tabletop). We don't have one, and I almost put this on my "don't buy" list, but I can see the value in it cutting down on packaging? Maybe you can use less packaging for your butter than we do. Lots of pretty options are out there, as well as practical ones. - Fiesta has a butter dish (of course). 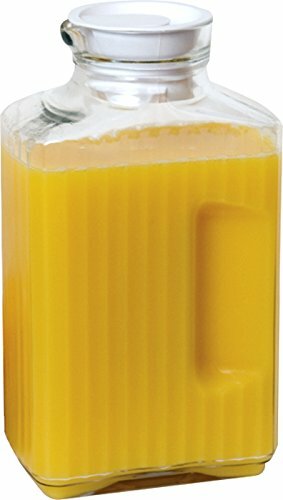 - Butter Bay has a line of Butter Keepers that you can drop the stick of butter into with no mess. - I like the more traditional one from Rosso Glass better. - Luminarc makes a clear glass one here in the US. - Mosser also makes a very pretty opaque glass one. I know people love these, and we have one (I think from Pottery Barn) that gets a moderate amount of use. I haven't found it makes my cakes any more distinguished, but it sure is pretty. If you want one, you might be able to find a cool one used (I have seen some pretty milkglass ones out and about). There are also tons of options out there. 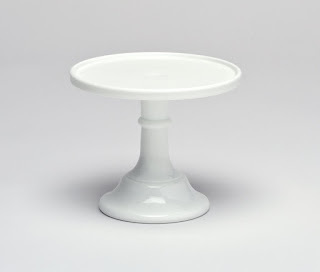 - Mosser Glass makes bakery-ready milk glass cake stands that would class up any kitchen (I love this black one). They make tons of them, so be sure to check out your options. - Epicurean has their own jam too. - As you may have guessed, Etsy rocks at cake stands, most of which look like they are wedding-ready, but could work in your house as well- a glass and crystal one, modern wood one, rustic wood one, a rustic wood one (they have quite the fancy lot), and a milk glass one. So many cake stands. - If you want the classic glass one, look no further than Anchor Hocking, which sells a beautiful version made in the US. 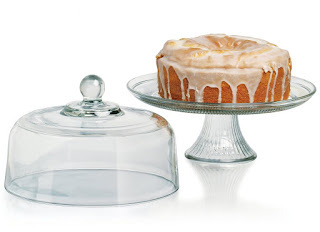 - If you want something a little more practical, Sterilite makes a cake holder that also works as a carrier. It's made in the US, but out of plastic, so weigh your options on that one. - Nordic Ware sells one that can work as a server in multiple ways and has a dome to keep things fresh. - Ateco makes one with a spinning top so you can use it for decorating or serving. I had one of these and it was cool, though I think you need major skills to justify it (which I don't). If you are like us, this will be the first thing you want to add to your dish set. Our bowls are pretty for dinners, but they don't do the greatest job at keeping a hold of soups and cereal, so we have simple white Ikea bowls (which we are retiring after 7 years). You can find simple bowls in consignment stores, but avoid plastic since you don't know the BPA content. Our pick for plastic would be Calibowls, which come in lots of cute colors (including understated white) and are specially designed to hold in mess better (they are also made in America with recyclable materials and packaging. Want more options? Another perfect Etsy opportunity! A few great options- In Her Words Ceramics, Leslie Freeman Designs, Karin Lorenc, or Chicago Ceramics, among many many others. My only useful suggestion here is if you can find one that works for gravy, creamer, and syrup, you are probably better off (and there are always tons at consignment stores). You never use gravy and syrup at the same meal, so it should serve multiple functions. 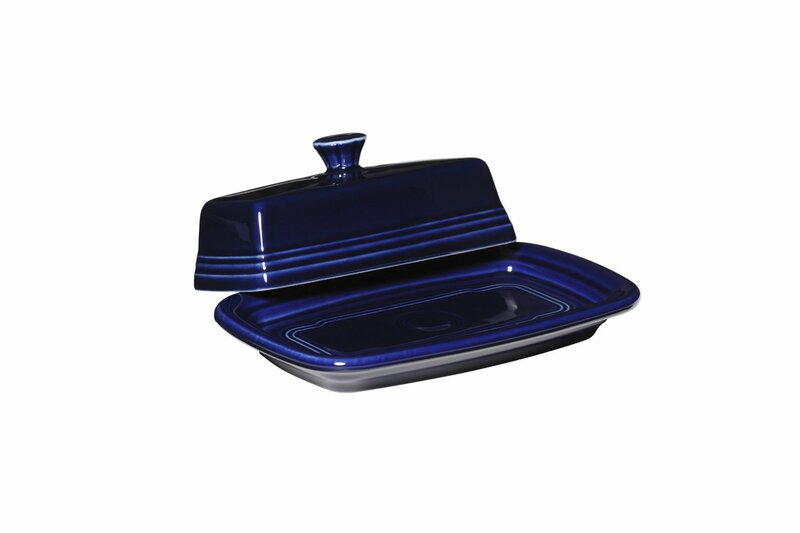 Most of the plate companies, like Fiesta, sell this as one of the go to accessories, so I would start looking there (just look out, because they sometimes ship that work overseas). You can also find about a million vintage options on Etsy. 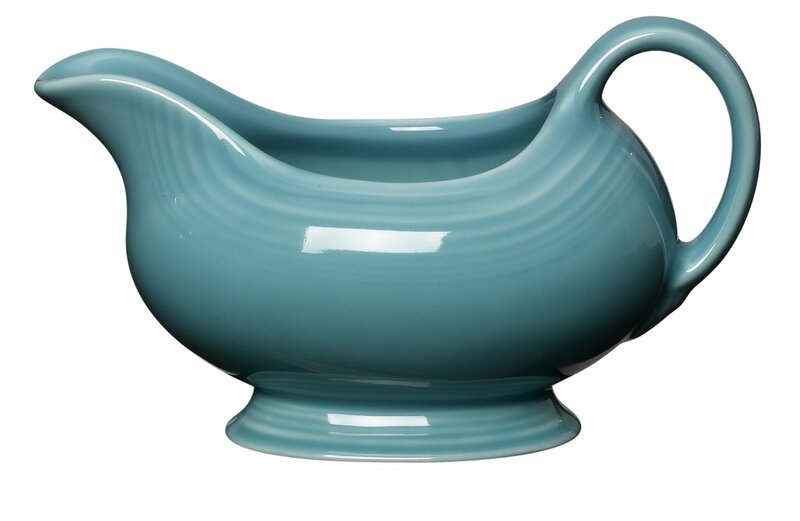 You can get a gravy boat from Bauer Pottery (also on Etsy! Who knew! 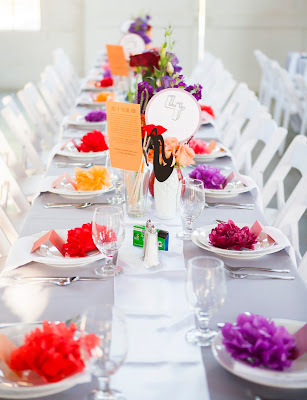 ), venuedecor, and Creative Trifles. 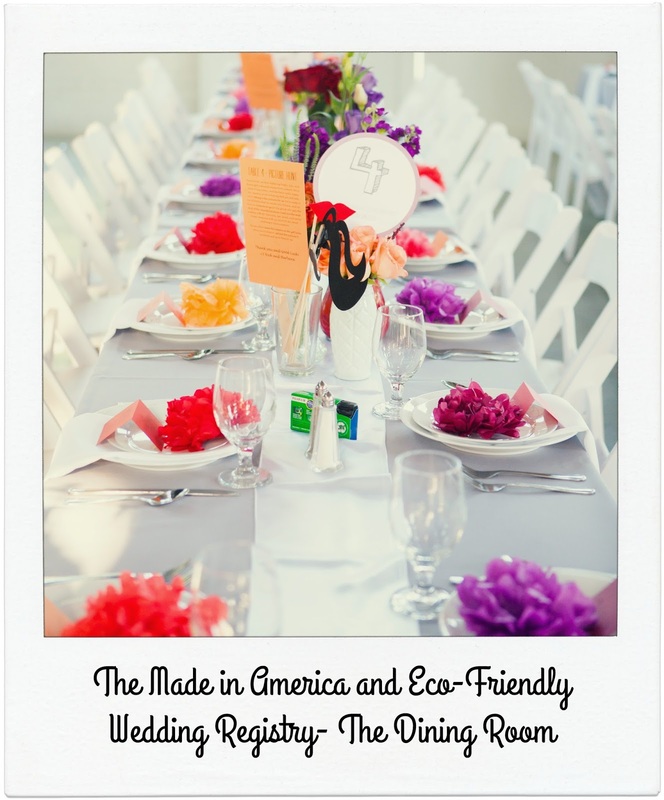 Ok, you might think cloth napkins are in the "too fancypants" category, but we use our cloth napkins every single day, keeping hundreds of paper napkins out of the trash (and keeping more trees standing). 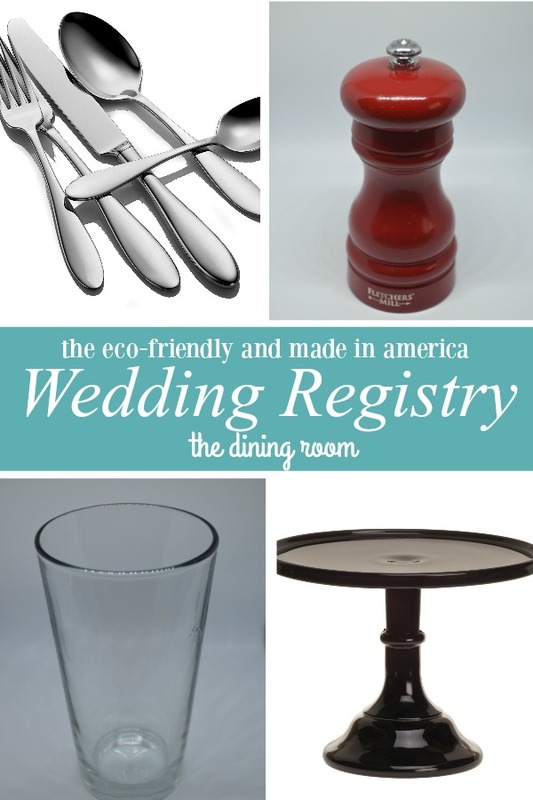 I think they are fun and homey, not to mention one of the most eco-friendly adds to your registry. DO THIS. Such a fun, simple change, and so easy to get used to. You can read about my favorite cloth napkins on Etsy here. I love cloth napkins, and I think they are a perfect thing to ask for, but you can also find some in consignment stores first if you want to see how they work in your home! Now is as good a time as any to address the walls in your house. First, picture frames are another easy find in consignment stores. We found our exact Ikea frames at Goodwill last trip for maybe a quarter of the price. You can find frames with art you don't want in them and even switch them out, and it is simple to repaint them if they don't come in the color you want. In other words, when it comes to frames, always start used. 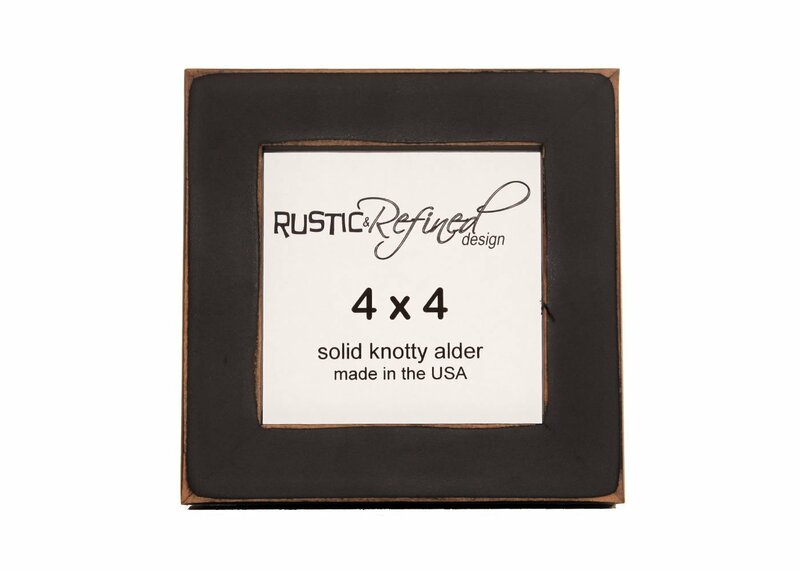 Our Pick- When we have needed a specific size we couldn't find, we have bought our frames from Rustic and Refined Design. Not only are they made in the USA, but they use reclaimed wood, so no trees came down either. The frame looks pretty and fits perfectly, though I would have to make a matte if I want one. 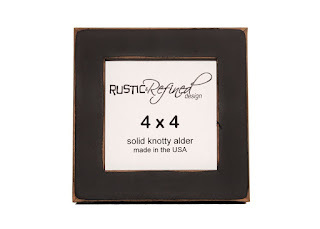 Have a more rustic style? Barnwood Designs are made in America with 100% upcycled wood as well. You can also find great Made in the USA picture frames when you can't find exactly the size you need elsewhere. Frame USA sells wood and budget frames out of the US. 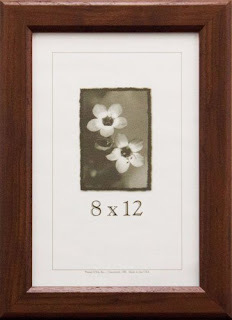 They aren't the most elaborate frames, but the clean look will complement more homes than not. Our Pick- Holland Bowl Mill sells a wide variety of wood and salad bowls. They even have ones with divots to rest your salad servers in. 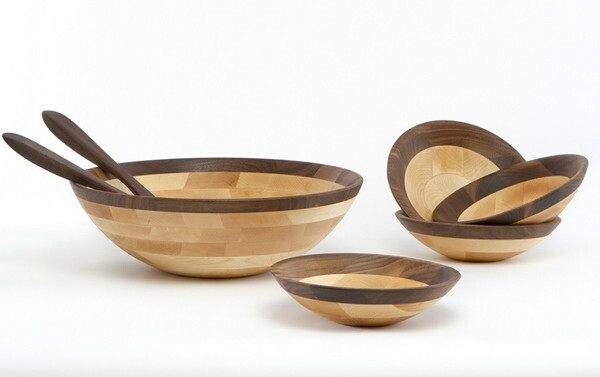 - New Hampshire Board and Bowls sells a large variety of very nice serving and salad bowls from sustainably harvested wood. They are a little expensive, but I bet they last forever. 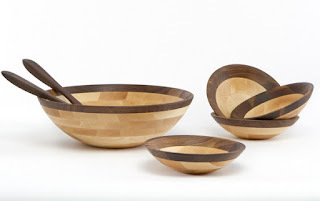 - J K Adams sells wooden bowls that would make for perfect salad bowls as well. You can always find tablecloths and placemats at consignment stores and antique stores, so this is a really great opportunity to buy used. 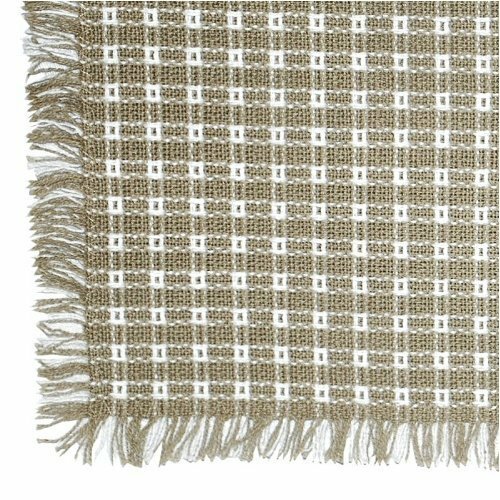 Our pick- Mountain Laurel Mercantile has a pretty extensive stock of hand-loomed tablecloths and placemats on Amazon. We received one as a Christmas two years ago; it looks pretty and stands up really well to the tough life of spills, crayons, and craziness. We bought another one, we loved the first so much. Perfect to register for if you want something that will last. 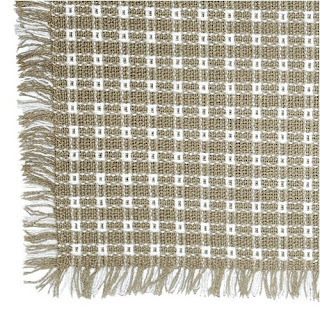 Sur la Table sells Chilewich table runners and placemats that look pretty and especially durable for outside dining? You can also buy tablecloths from Etsy stores. Cocktail Shaker- If you aren't sure if you need this, you probably don't. - Tervis has some if you do though. 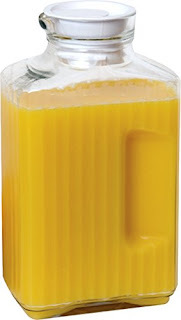 - The Mason Shaker is especially cute. - Libbey has a whole set if you want to go big, but most of it is imported. Chargers- We all love to joke about charger plates (wait, is that just us?) but you can probably skip them unless you really need to step up your table. And even then, it might be better to wait to address the specific event and buy chargers that work then. China- What? I mentioned this before? I will do it again. Cool your jets on the china. Most of us do not live lives that require a formal dining set in our home. If you want to give somebody that fancy of a meal, take them out to dinner? Buy one fancy accessory to jazz up your multi-purpose plates? If you don't have heirloom ones coming, there are plenty of antique or used sets out on Etsy or consignment stores waiting to be claimed. Because all the china anyone will ever need already exists in the world. If you do a simple color scheme, especially blue and white, I bet you could curate a set this cool for a tenth of what you would spend on china in any other way. If you do need your fancy plates fresh, because the Countess will be coming for luncheon, Lenox's fine china is made in the states. 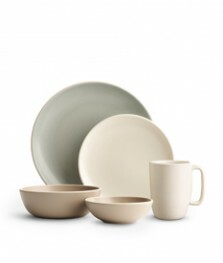 All their transitional and casual dinnerware is not made here, so keep that in mind as you browse. I like their tie in pieces with Kate Spade, that has really sweet and playful sets. There are also vintage Lenox sets, so you could do that instead. Pickard Porcelain has also been made in the US for over a century, and they have the kind of gravitas to look like they have that history behind them. Incredibly classy looking. I have never even eaten off plates that distinguished- I'm waiting for my White House invite. Again, when are you going to use this? Wouldn't a trip be better? Mugs- Don't register for mugs. Mugs can be counted on to come to you without ever asking for them, whether you already have a pretty matching set or not. If you can have a weird tourist mug or one with a family member's face on it, why would you want a plain one? At the least, you can get some great, super original mugs on Etsy. Worst case scenario, you can buy some at any Goodwill. But don't register for mugs- that's crazypants. Napkin Rings- We have 3 sets, all of which we have used 0 times, not because they aren't nice, but because we never think of it until afterwards. I just think there are better details to step up your tabletop, and if you haven't used them by now, why would marriage change that? Not worth it. Vases- No one needs to go out of their way to get extra vases, much like mugs, they always seem to show up. If you have one vase, you have plenty for now. Trust me, you won't only have one for long. Water Goblets- Do you live at Medieval Times? Do you eat turkey legs with your hands for dinner? Does your water mean that much to you? This one is so weird to me, and so many registry lists treat them as an absolute necessity, but each to their own I guess. If this is something you want, these ones are fit for a king (of theme restaurants with jousting). Cheap Plates and Cups for Eating Outdoors- I know lots of people who have cheaper sets they bring with them camping, or to picnics, or just to eat in their backyard. 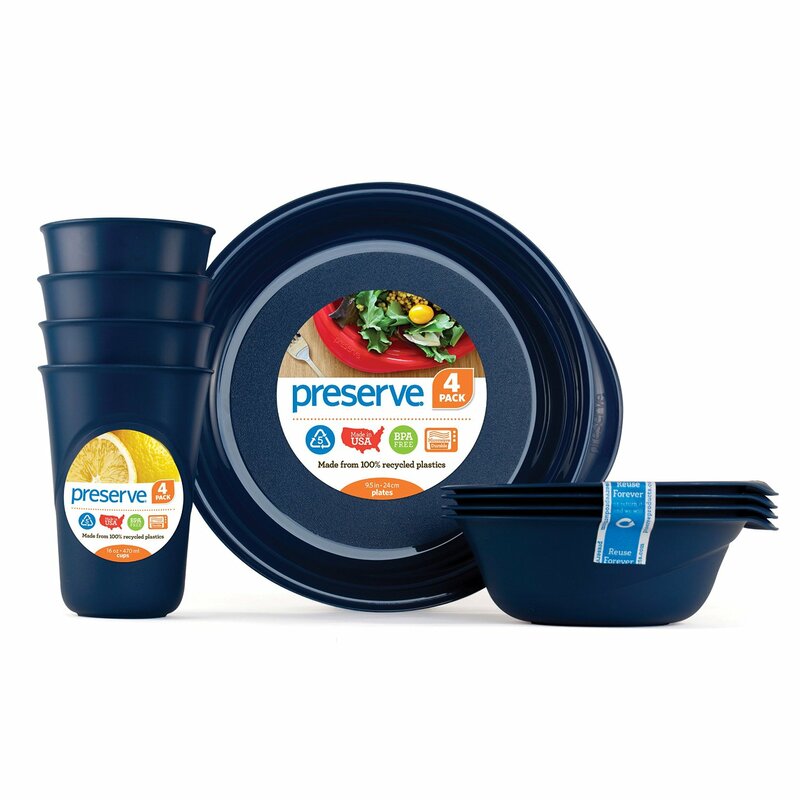 For camping and picnic-ready plastic plates, it doesn't get better than Preserve; made in the US out of all recycled and recyclable materials. They will even take them back when you are done with them. Want to make a memorable set? This gorgeous picnic basket could be perfect (or you can find one in a consignment store- I see them all the time, but I resist, so it is there waiting for you). Milkshake and Smoothie Glasses- These glasses from Libbey might be perfect if you love making your own milkshakes or smoothies. It could be a very thoughtful gift for the right couple! Olive Oil Dish- Who doesn't love getting that little plate with olive oil, vinegar, and garlic to dip their bread in at restaurants? Maybe someone loves them enough that they would want them at home. Maybe you are going to their wedding? Pitchers- Not everyone needs one (I don't know many people who don't use a water filter pitcher for their water), but if you know someone who likes making their own lemonade or something like that, it might make a cool gift. Heath Ceramics sells a pitcher so cool, it makes all other pitchers nerdy. Fiesta of course has options to go with their plates. I would recommend getting a pitcher with a stopper, like this one from Anchor Hocking, which might turn out to be more useful.I also think this Mosser Jadeite pitcher is memorably gorgeous, so it might fit your style! Straws- Some people really love drinking from straws, but it is well-established the majority are a blight on the environment. Skip the plastic and register for glass straws to use with your barware at home. Wine Rack- Lots of people love wine. It's alcohol, but it feels classy. 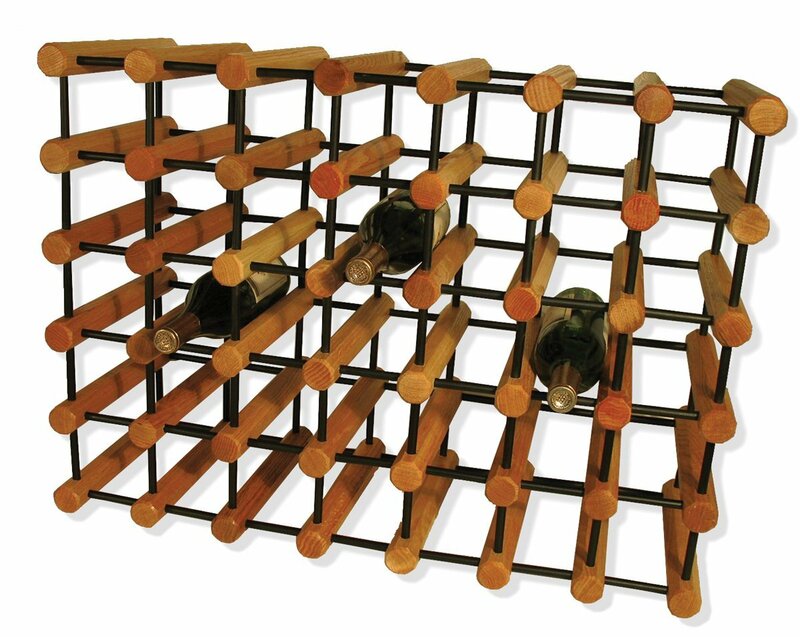 If you have a friend who likes wine, keep that friend, and consider buying them a wine rack like this one from J K Adams, so it is made in Vermont. If they don't have your style, Wine Racks America also sells a wide variety of wine racks made here. I could care less about these kinds of things, but if you need a wine stopper, these owl ones are made of silicon so they should really last, and all the packaging is recycled. Plus, they are cute. We still have more registry to check out! Check here for more info! Alright, this is it for now! As always, let me know if you find more things we should add to this list. See you next week for Bathroom and Bedroom stuff, and be sure to check out the Kitchen Part 1 and 2 of the Registry! 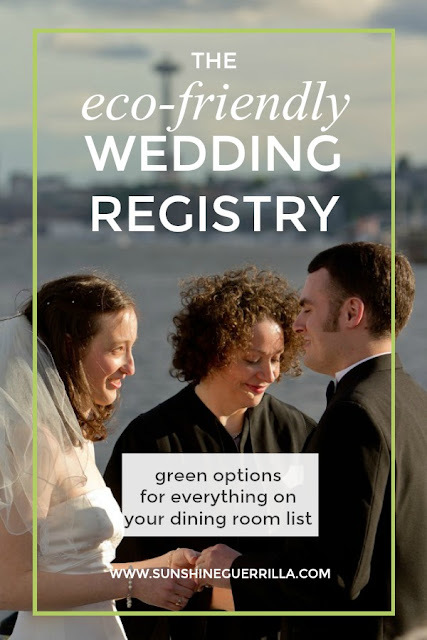 You can find all of the Wedding Registry lists here or you can Browse the Green Registry on Amazon.